Carpet rakes are ideal ways to rejuvenate your carpeting. They can pull pet hair from deep within rugs and carpets better than a vacuum can, revitalizing tired-looking carpeting (Source). They're also good for removing deeply ingrained food stains- especially in conjunction with a full carpet-shampooing (Source). 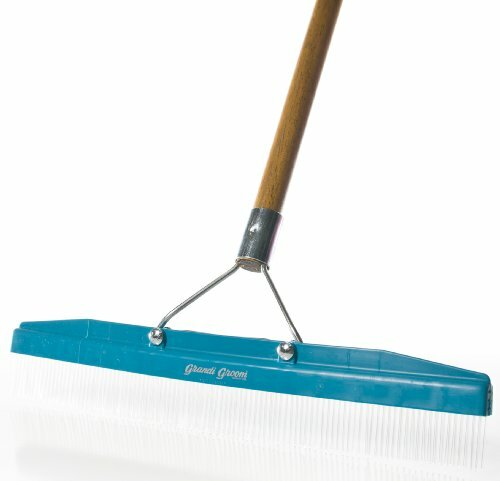 The 2 lb., Groom Industries Grandi carpet rake is our top pick- it is a flexible carpet rake that is strong enough to dig into carpeting without breaking, great for high-traffic areas that look really worn down, and provides great support before and after a thorough carpet cleaning (Source). The tines (the teeth on the rake) are made of smooth nylon, don't mark up the carpet, and help give indoor carpeting a professionally cleaned look when used in conjunction with a vacuum. Users do say that the raking can be a bit strenuous, especially if you have a big shag carpet, and can be a little difficult to get into tight spaces. Overall the Grandi carpet rake can really perform miracles on rugs and carpeting that are matted with dirt in high traffic areas, whether you are using it by itself, or with a Dyson vacuum or a carpet steaming. Let's examine five of the best-selling carpet and rug rakes on the market today and see how they compare. 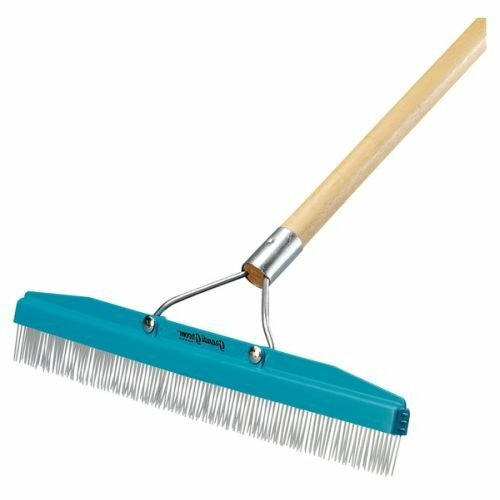 This carpet rake offered by Groom Industries is a well-designed and effective product that would refresh the look of your old and matted carpet. What users love most about the carpet grooming rake is that it’s light, easy to use and useful in places where it’s hard to vacuum. But some do note it doesn’t help a lot with matted rugs. With its 18 inch head, wood handle, stiff, plastic tines and a size of 60 x 18 x 4 inches, the Groom rug rake covers a lot of area quickly and it’s used by many professional carpet cleaners. Even though it’s expensive, it seems like an ideal solution for housewives that want to fresh-up their old rugs and remove persistent dirt. One customer shares that the broom rake is stiff and sturdy enough to bring out dirt and hair and she achieved such excellent results with it after shampooing the carpet that she couldn’t believe it. Another buyer mentions that the universal rug rake is perfect for hallways and small spaces where it’s impossible to get to with a vacuum cleaner and that after raking the carpet a few times in different directions it really looked fluffed up. However, some customers complained that the Groom carpet broom failed to remove embedded pet hair and they were very disappointed. This Perky carpet rake by Groom Industries is an excellent tool for making your carpet look good again. Users love that the carpet grooming rake is useful for places with high traffic like a kitchen or a bedroom and that it’s easy for use and storage until you need it. With a size of 19.5 x 5.5 x 5.5 inches, a 3 piece plastic handle and plastic bristles, the carpet groomer really brings back that fluffy look that every homeowner wants, but some customers note that the bristles break easily and it can’t be used if too many of them are missing. However, this rake for carpet sounds like an ideal solution for removing any dirt and hair left after vacuuming. What one user shares about the perky rake is that due to the stiff, plastic teeth it perked up and fluffed up her carpet perfectly and she’s glad that she has it to help her maintain her carpets’ looks. 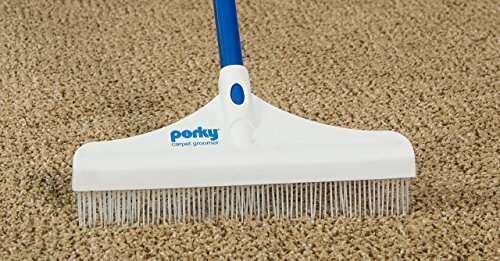 Another consumer mentioned that the perky broom rake made a huge impact on her life because it’s no longer a chore to clean pet hair out of her rugs – she just rakes several times and then vacuums – and she has a carpet looking freshly cleaned at no time at all and with minimal effort. However, some purchasers have complained about the durability of the rake and are disappointed how easy the plastic combs break. This Universal carpet rake seems well-designed and ideal for cleaning carpets in depth and removing embedded fur. Its users love that they can reach otherwise impossible places like under the furniture or the staircase, or the corners and that it’s not necessary anymore to startle their animals so often with the sound of the vacuum cleaner. However, some note that it didn’t pull the carpet pile as deeply as they expected. With tin-plated bristles and a 4-foot extendable pole, which locks in place, this pet hair rake is ideal for cleaning and fluffing rugs and carpets without damaging them. 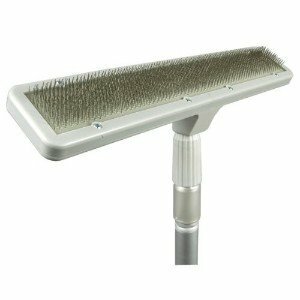 Overall it seems like a good choice if you are looking for an effective pet hair removing rake. One purchaser shares that the metal rug rake did wonders with her carpets and removed excessive amounts of pet hair. Another buyer comments that she has only to pull the pet rake across the carpet to get the job done. 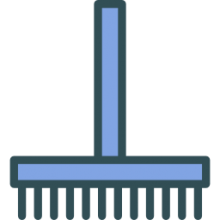 On top of that, users are pleased that the carpet rake for pet hair collects the embedded fur, not roll it into a ball and leave it, so it’s easy to clean it away. However, most of the consumers are complaining about the handle, which seems to collapse regularly and requires a daily tightening. This 18’’ wide Groomer Carper Rake is a handy tool for renewing your matted, crushed-looking carpets quickly and without much effort. Users love that the carpet rakes works really well on matted rugs bringing out old dirt and dust and that it’s possible to cover large areas with it. But some note that Groomer carpet rake can’t pick pet hair and works better on thin carpets. With its 54’’ long thick handle and stiff, but flexible bristles it brings out dirt, loosens embedded hair and makes vacuum marks disappear, so it seems like an effective tool for cleaning carpets and a good choice for every household. One customer comments on how well-packed the plastic carpet rake arrived and how pleased she was with the result – her carpet looked fluffed up and cushy. Another buyer shares that after using Groomer rake her carpet looks as if it is professionally cleaned. She also says that the grooming rake is lightweight and you just need to drag it across the carpet to make the vacuum marks disappear. However, some people weren’t happy with the plastic bristles and the fact that it’s mostly useless when it comes to pet hair. Also, one customer says that it’s not so easy to work with it, but raking with the carpet cleaner can replace fitness exercises. If your carpet has a matted, dirty look this 12″ wide carpet rake offered by Roberts seems a good solution for you. Users love that the carpet broom is light, convenient to use, effective at cleaning dirt and fluffing old carpets and it speeds the drying time after shampooing. However, some people note that for them the Roberts rake is overpriced and they had some problems with the handle. With its flexible nylon teeth and the 54″ long handle, the rake carpet is good for high traffic places like a kitchen and for wall to wall carpets and rugs. It seems like a good choice for people looking for an effective carpet-cleaning tool. Users mostly share their positive experience regarding this rake for carpets – one buyer shares that she managed to release dirt that was impossible to see or pick up with a vacuum cleaner. Another comment on how much she likes the concept of the rake and that her carpet looks so much better afterward, while another one expresses her delight at how great it works on dog hair. However, people complain mainly of the handle that seems to loosen constantly and they mentioned that it was hard for them to assemble it without instructions. Many users who have purchased a rug and carpet rake did so after seeing them used by professionals in their home, or on one of those as-seen-on-TV infomercial segments. The manufacturers of the five different rug rakes that we examined generally advertise their efficacy for removing cat dander, dog shedding, and really working out dried debris and stains from indoor and outdoor carpets and rugs, helping to rejuvenate and enliven old and tired-looking carpeting. Even the best vacuums aren't able to pull out ingrained hair and stains- many users will use their carpet rakes in their homes and office environments prior to vacuuming, so that they're able to pull out unwanted hairs from deep within their shag carpeting. The rake's bristles are generally reinforced, so that they are strong, but they're also designed to be flexible, so that when you are raking your carpet and the carpet rake encounters a snag, the bristles do not break off. Many pet owners can attest that, whether their cat or dog is long or short-haired, the shedding can be egregious. Pet hair can ingrain itself in carpeting- and remain immune to even the strongest-sucking vacuum cleaners around. One woman who purchased the Universal rug rake is in love with her product. She owns a large-breed dog that sheds a lot and her toddler frequently has his face pressed against the ground- this was not a hygienic situation. She finds that using the carpet rake once a week or so is a great workout, keeps her carpeting looking clean, and removes the excess dog and pet hair that could potentially harm her new child. Another user who purchased the Universal rug rake advises that it be used as a pull broom- and says that he likes it because it actually collects the pet hair unlike other styles of rug rakes that create rolls of hair that need to be picked up piece by piece. He also advises that while this particular rug rake will work on all different styles of carpets, it does perform better on denser and shorter rugs. He also advises that you will need to figure out the best pressure and speed to use your rug rake for the different types of carpeting that you have- because if you push or pull too fast on certain types of rugs it will make the rake 'hitter' across the surface, without gripping into the shag. That said many people wonder whether rug rakes actually work at all. The folks over at simplygoodstuff.com have a great write up- they say that these rug rakes do have many benefits including: non-electric operation, being fairly lightweight and easy to store, an ability to work inside your home or even your car, and some models will even hold onto the furry you pull from the rug. All of that said, these carpet-cleaning tools are an inexpensive way to revitalize worn-out and high-traffic indoor and outdoor carpeted areas. You can use them in conjunction with your traditional vacuum cleaner and really get a professional-cleaned look.